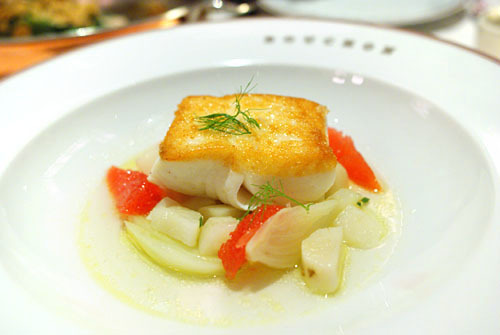 When José Andrés' The Bazaar was unveiled last November 17th, it was arguably the hottest opening of 2008. Now here we are, a year later, almost exactly to the date, facing the debut of Bouchon, easily the most widely anticipated restaurant of this year. To get an idea of the excitement surrounding Bouchon, one only had to try to make reservations for opening night. The reservation line opened promptly at 11:00 in the morning, and was almost immediately saturated. One of my dining companions, Ryan, was finally able to get through at 11:09, and secured the very last reservation for four. So figure that roughly 95% of the restaurant was booked within 10 minutes, no easy feat, given that the place seats 200 guests. 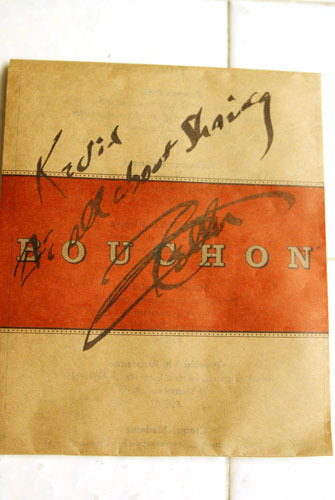 Within 24 hours, it was reported that Bouchon's first four days of service were completely filled. That, people, is the draw of Thomas Keller. 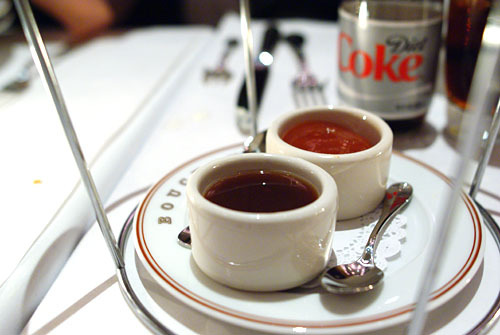 Keller, in a way, returns home to the Southland with Bouchon. The chef was born in 1955 at Camp Pendleton to Betty and Edward Keller (whom I am grateful to for helping me secure my first French Laundry reservation; sadly, Ed Keller passed away last April, due to injuries sustained in a car accident a year earlier), the youngest of five boys (Jimmy, Robert Charles, Michael, Joseph, in addition). After his parents divorced, the family moved to Palm Beach, Florida, and Keller began working as a plongeur (dishwasher) at the Palm Beach Yacht Club, which his mother managed. He quickly moved up the ranks (aided by his brother, Joseph Keller, who was already a chef), all the while discovering his passion for cooking (that famous hollandaise story occurred here). One summer, Keller made his way up to Rhode Island, where Roland Henin mentored the young chef at The Dunes Club, teaching him the basics of French cookery. After leaving Narragansett, Keller returned to Florida, working at various places, including now-shuttered Cafe du Parc in Lake Park, before heading up to Catskill, New York to work at the tiny 20-seat La Rive. Largely given control of the kitchen, it was here that Keller really started to come into his own as a chef. He eventually tried to purchase La Rive, and after the owners refused to give it up, moved to New York, helming the kitchens at the French bistro Raoul's. 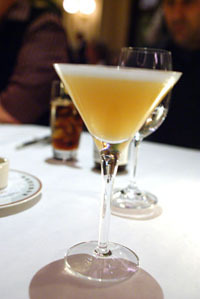 Following, Keller worked simultaneously at Christian Delouvrier's Maurice at the Parker Meridien Hotel and with Daniel Boulud at the Polo Lounge at the Westbury Hotel. The year was 1982; Keller was 26. After it was discovered that Keller was "playing both sides," working at both Maurice and Polo, the chef decided to stage throughout France, apprenticing at eight restaurants, including Guy Savoy, Le Pré Catelan, and Taillevent. Keller returned to NYC in 1984, and was hired at Restaurant Raphael, and then as chef de cuisine at La Reserve. Keller left in 1986 to open his first restaurant, Rakel, with former boss and now partner Serge Raoul. Debuting in 1987, Rakel quickly garnered critical acclaim, but its popularity eventually waned; Keller left in 1990. Later that year, he decided to move out west, landing at the Checkers Hotel in Downtown LA, where he was executive chef. Keller left the hotel in 1992, when he began to dream up plans for his monumental restaurant. The space was already being used as an eatery, and the chef spent the better part of the year raising the $1.2 million needed to buy the place from Don and Sally Schmitt. 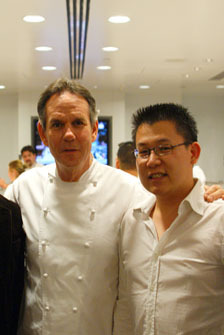 The French Laundry reopened in the summer of 1994, and over the next few years, racked up numerous awards and accolades, cementing Keller as one of the defining chefs of our generation. 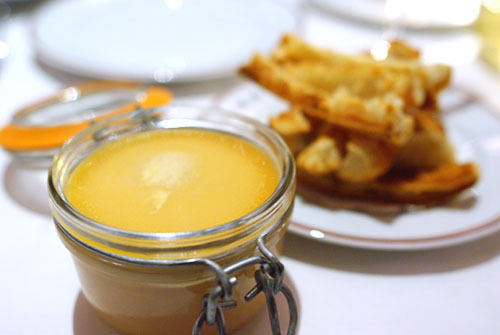 The success of TFL allowed Keller to open Bouchon Yountville with his brother Joseph in 1998; Bouchon Bakery opened five years later (the Bakery's New York outpost debuted in 2006). In January 2004, Bouchon and Bouchon Bakery Las Vegas bowed at The Venetian. 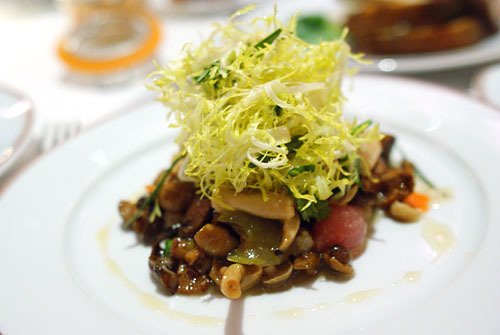 A month later, Per Se opened its doors to considerable fanfare. Keller's latest venture prior to Bouchon Beverly Hills, the comfort food specialist Ad Hoc, premiered in September 2006. With this newest Bouchon, Keller now commands nine eateries in four distinct locales. 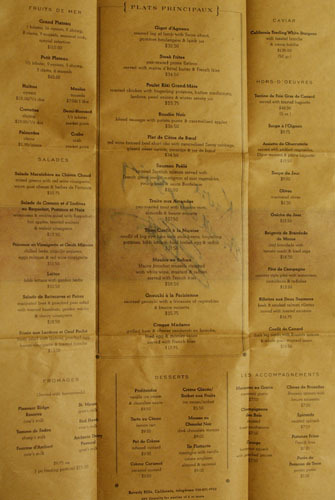 Interestingly, in a 1996 article in the New York Times, Keller was quoted as saying that he had no intentions for such an empire: "If this is Thomas Keller's cuisine, how can you have it in two places?" he said. In any case, despite the fundamental change in his M.O., Keller had always possessed a certain fondness for bistro fare, and thus Bouchon was the chef's attempt to create a place where one could enjoy a perfect steak frites, a tiptop croque madame, or merely some first-rate oysters, all washed down with some Champagne--it's an attempt to capture the heart, the tradition, of French cooking. 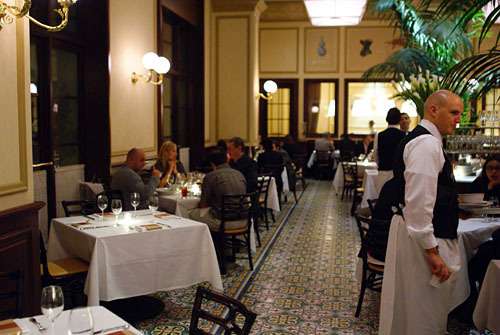 In fact, Bouchon is named after, well, the bouchon, a type of Lyonnaise eatery serving straightforward, yet profound food, all in a small, familial, convivial, almost home-like atmosphere. Though such a vibe can't exactly be duplicated here in Beverly Hills, the idea was to create something that was equally as engaging. To lead Bouchon's kitchen, Keller tapped California native Rory Herrmann, who will be the Chef de Cuisine. Herrmann's last post was as the Private Dining Chef for Per Se; he'd joined Per Se as a chef de partie upon its debut in 2004. A graduate of the French Culinary Institute in Manhattan, Herrmann has cooked at a number of notable eateries besides Per Se, including Alain Ducasse's eponymous Essex House restaurant in New York, Ducasse's Mix in NYC, and Dan Barber's Blue Hill. The pastry department will be helmed by Scott Wheatfill, whose last gig was at Bouchon Las Vegas, where he was Pastry Chef. Wheatfill graduated from the Cordon Bleu College of Culinary Arts in Las Vegas. The front-of-the-house team is led by General Manager Grew Rowen, who came to Bouchon from Traci des Jardin's Jardiniere in San Francisco. Rowen also worked at Restaurant Lulu and the Four Seasons up in SF, and even as an Assistant Manager at Chaya Brasserie, located just a mile away from Bouchon. Meanwhile, Alex Weil is the Head Sommelier, and comes to Bouchon from Osteria and Pizzeria Mozza, the Four Seasons, as well as Wally's Wine and Spirits. Weil will be coordinating wine service along with James Hayes, Associate Wine Director for all Thomas Keller Restaurant Group (TKRG) restaurants. Finally, overseeing everything is Brian Cochran, Director of Operations for the entire Bouchon franchise, who started his career with TKRG as General Manager of Bouchon Las Vegas. The interior, designed by the omnipresent Adam Tihany, doesn't stray too far from the other Bouchons, enveloping diners in Parisian salon-esque atmosphere. Bouchon actually spreads out over two levels (each with its own bar), with the first floor largely taken over by Bar Bouchon (Keller's first wine bar and small plates concept, opening the second week of December). 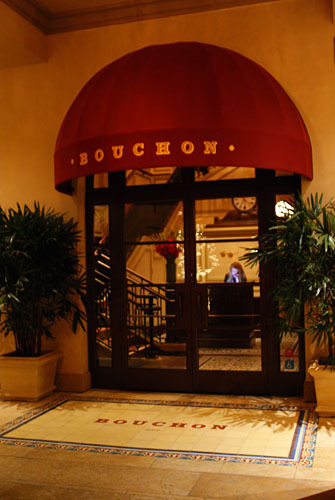 We entered from the ground floor, and after conversing with the hostess, were led up the stairs to Bouchon proper. Up here, in addition to the main dining room, there's also a small private room for 12, as well as a "Champagne lounge" for up to 16. 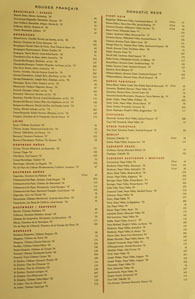 The menu, as one'd expect, is fairly straightforward, and not too dissimilar from what's found in Yountville or Vegas. 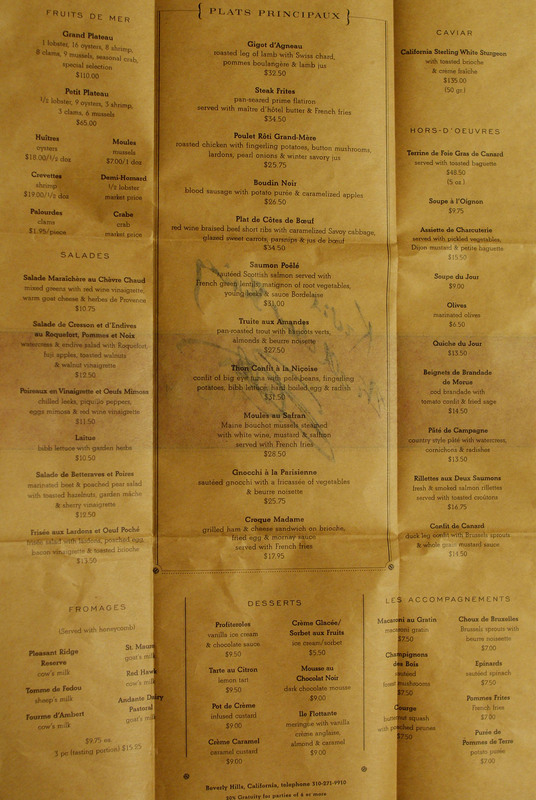 However, there are a few items that appear to be at least somewhat unique to BH--cotes de boeuf, tuna, frisée salad, boudin noir--though perhaps these represent merely seasonal variations, or lack of online menu updates from the other locations. Click for a larger version. 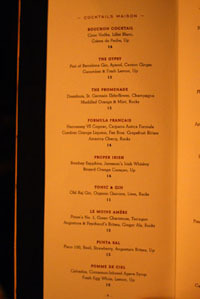 As mentioned above, the booze at Bouchon is the task of Head Sommelier Alex Weil. 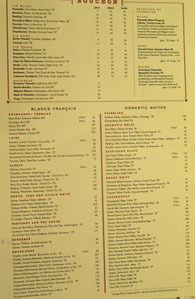 The restaurant's wine list (click for larger versions) is heavily focused on French and Californian producers. Mark-ups are significant, but not unreasonable. 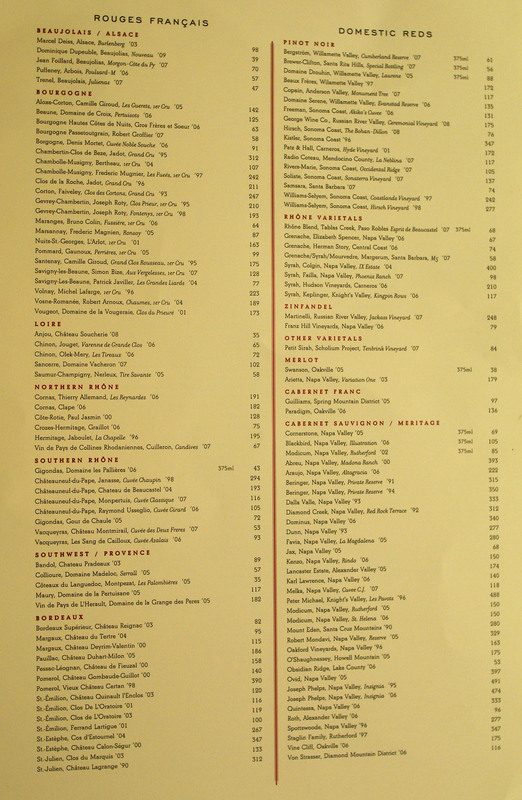 One notable aspect of the wine service is the Vin de Carafe program, which stems from traditional bistros in France, where low-cost, high-quality, locally-produced wine would be poured by the glass or carafe from a large barrel in the restaurant. 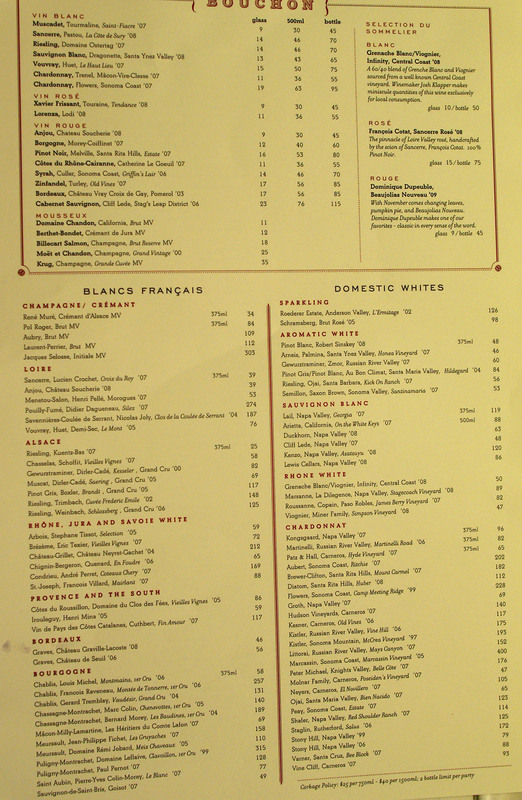 Since US law doesn't allow such a thing, Bouchon purchases barrels of mature red and white wines directly from producers, to serve in a similar manner in glasses [$8], half-liter carafes [$25], or liter carafes [$50]. 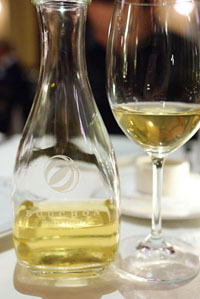 Currently, Bouchon's white is a Chardonnay from Matt Dees, winemaker for Jonata. We found it quite delectable, with a refreshing lightness and brightness not always found in California Chards. For red, we're talking about a Pinot Noir from Stolpman Vineyards' Sashi Moorman. Again, a great wine for the price. If you're not into wine, beer is also a viable option here, with at least three beers on tap, and around 10 selections available by the bottle. 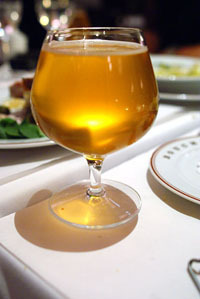 In fact, there are two beers made exclusively for the Bouchon family of restaurants. 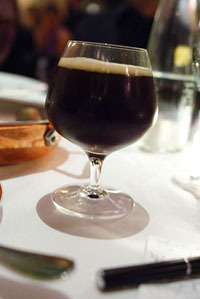 The first is named Blue Apron [$12], a Belgian Brown Ale produced in collaboration with Brooklyn Brewery in New York. It showed fantastic dark fruit and chocolate character--great with dessert! The next is making its debut in Beverly Hills, and is dubbed White Apron [$7]. It comes from the famed Russian River Brewing Co in Sonoma and is of the Pilsner style. We found it reminiscent of Belgian Pale Ale, with delicious spicy and fruity notes over a lively acidity. 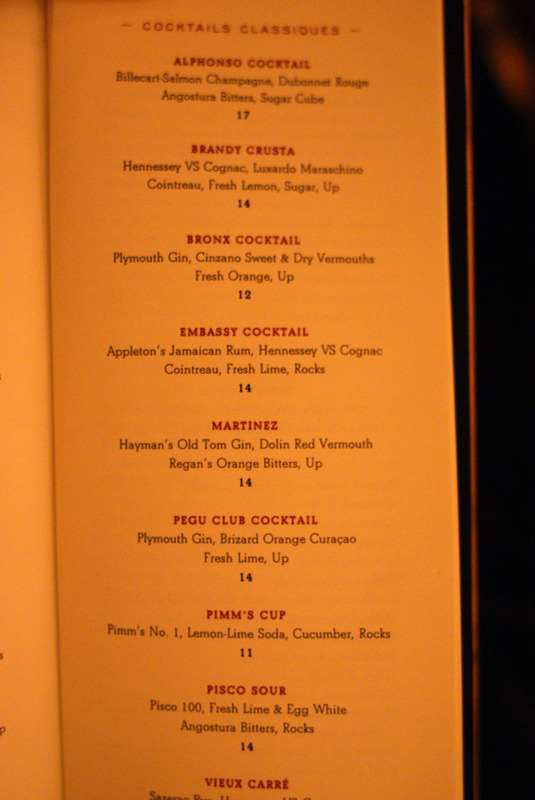 Finally, if you're into the hard stuff, Bouchon sports a full bar, and of course, we just had to pick a few cocktails from the drink menu (click for larger versions). 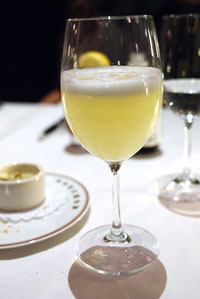 I ordered the Pisco Sour (Pisco 100, Fresh Lime & Egg White, Angostura Bitters, Rocks) [$14]; it was a classic interpretation of the drink, which Ryan described as tasting like an "adult Fruit Roll-Up." 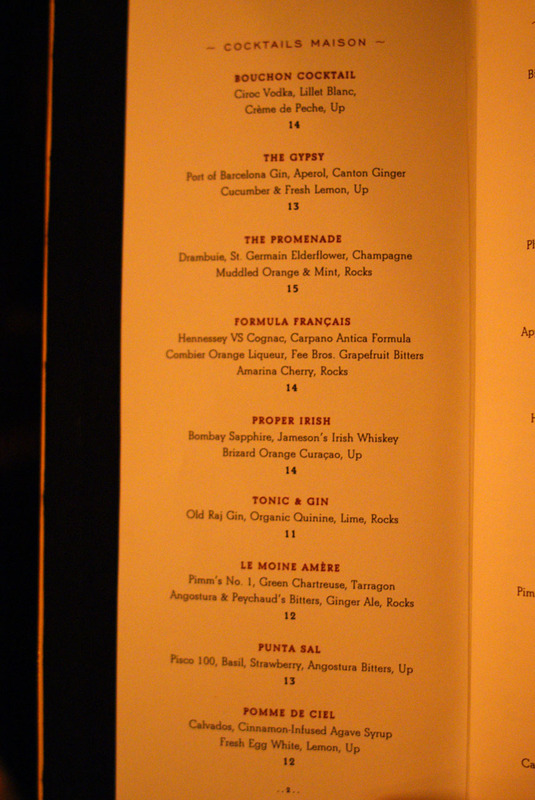 I also was able to try the Pomme de Ciel (Calvados, Cinnamon-Infused Agave Syrup, Fresh Egg White, Lemon, Up) [$12] and the Le Moine Amére (Pimm's No. 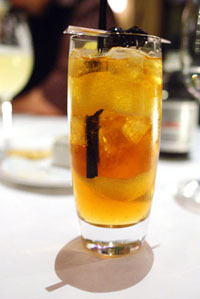 1, Green Chartreuse, Tarragon, Angostura & Peychaud's BItters, Ginger Ale, Rocks) [$12], which had a fantastic herbal finish to it. 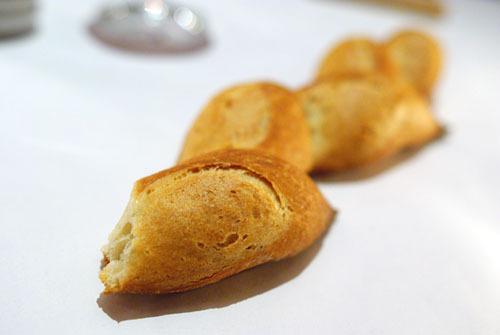 Bread consisted of pain de epi served with a wonderfully salty butter, as well as pieces of toasted, sliced baguette. Beau Soleil, New Brunswick - Nicely crisp, with an extremely briny finish that belied their mild attack. Bagaduce, Maine - Milder yet sweeter, with more flavor up front, leading to a slightly bitter finish. Umami, Rhode Island - One of my favorites, with a great interplay of sweet, salty, and even petrol flavors (in Ryan's words). Island Creek, Massachusetts - Very nice; a meaty, salty oyster with a briny finish that seemed to strengthen after about 10 seconds. Fancy Sweet, New Brunswick - A very focused, concentrated oyster, quite nice. Quite simply, brandade is a fine purée of salt cold (morue), olive oil, milk, garlic, and potato, a specialty of the Languedoc and Provence regions of France. 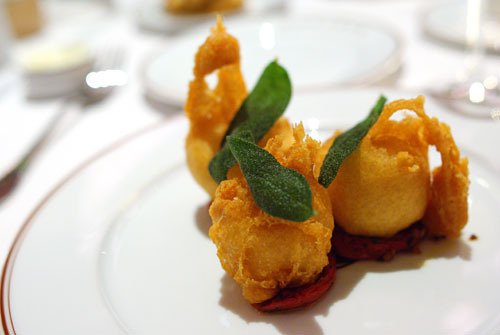 Here the brandade is turned into fried fritter form, possessing a light, delicate body as well as a profound cod flavor, balanced beautifully by the sweetness of the tomato and pepperiness of the sage. Very, very good. To this very day, the best cold preparation of foie gras I've ever had is still the Moulard Duck "Foie Gras Terrine" that I consumed on my first French Laundry visit (the best hot version was at Guy Savoy). Thus, expectations were expectedly high. I was a bit surprised at the presentation here, with the liver served simply in a canning jar (à la Church & State), accompanied only by toasted bread. Nevertheless, the terrine was pretty stupendous, superbly capturing the quintessence of foie while still remaining refined and approachable. A bit of salt elevated things even further. Quiche is something that I hadn't had in years prior to this meal. It's basically a dish of egg custard and other ingredients, baked in a pastry crust. Though often associated with French fare, it's actually from Germany originally, specifically from the Lothringen region, which is now known as Lorraine. The word "quiche" even comes from the German kuchen, or cake. The quiche of the day was a classic Lorraine according to our server, but due to the presence of spinach, it was more like a Florentine. It had a nice rustic flair, with a fitting interplay between the egg and spinach components. The greens, meanwhile, were a great counter to the heaviness of the quiche. A pâté de campagne translates to "country terrine," and true to its name, is a more rustic preparation than you'd find with many other pâtés. I appreciated its gritty, coarse texture, nicely moist, with identifiable pieces of pork mixed in (though I would prefer even larger chunks). Its flavor was markedly savory, with a substantial liver-y twang to boot. I liked the contrast of the peppery watercress, sour cornichons, and bitter radishes--all were helpful in balancing out the gravity of the pork. 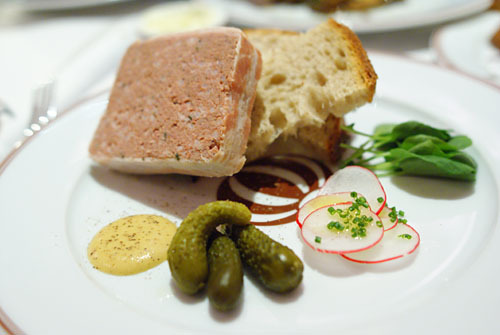 Traditionally, rillettes is a preparation of pork whereby the meat is cooked in fat and subsequently shredded into a paste. I had a superb version recently at The Tasting Kitchen in Venice. 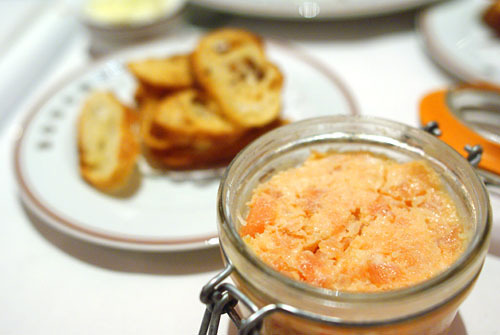 Bouchon, however, substitutes salmon--fresh and smoked--for pork, which is blended, but not cooked, with fat. The result was stupendous: a luxurious pate, imbued with the pure essence of salmon, but simultaneously rich, dense, and fatty. Excellent. One of the specials of the night, this was a mix of mushrooms, done à la grecque, or cooked with vinegar, lemon, herbs, and olive oil, served cold. This resulted in a distinct sweet and sour sapor to the dish, which was light and refreshing. However, I would've preferred a more savory, earthier flavor, to be offset by the frisée. 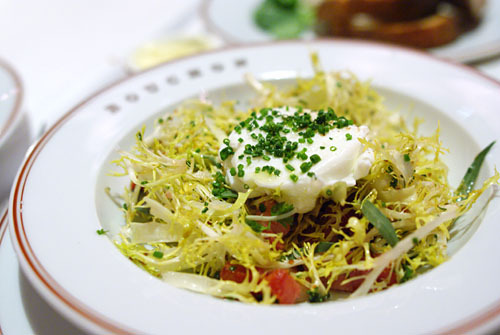 With lardons, egg, and frisée on hand, it'd be fairly difficult to screw things up. And indeed, the combination of salty lardons, luscious egg, moderating brioche, and light frisée was excellent, an almost faultless commixture of tastes and textures tied together by the overarching creaminess of egg. Superb. Another special was the halibut. Texture-wise, the fish was near-perfect--soft, flaky, superb. By itself, the halibut was supremely mild, delicate even. I enjoyed the contrast provided by the sunchokes and tarragon, but felt that the fruit overwhelmed the fish's natural savor with a pronounced sweetness. The accompaniments needed to be toned down a bit. The most controversial dish of the night, this was Bouchon's take on Truite aux Amandes, or trout amandine, a very classic dish of trout, with roots in French and Creole cookery. 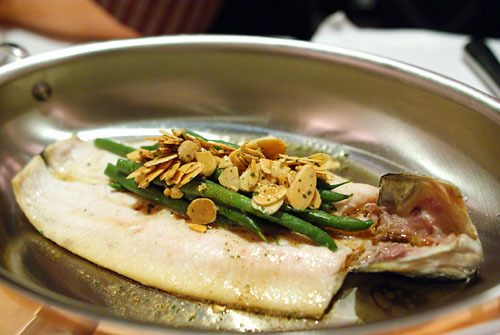 It's typically made by cooking trout filets in butter, and topping the fish with beurre noisette (brown butter), parsley, lemon (making trout Meunière), and almonds (turning it to Amandine). The trout alone was very mild, possibly underseasoned. Christine, who's had the dish before on multiple occasions at other Bouchons, even sent hers back. We thought that it might've been intentional, but when we asked Chef Keller about it, even he admitted that it wasn't, and that the kitchen was still learning. Looking past the fish, I appreciated the vegetal tang of the green beans, and surprisingly, the almonds weren't overpowering at all (I expected them to render the fish overly sweet). This needs to get better. The tuna was easily the most successful fish entrée of the night. I could've easily eaten the tuna by itself--mild at first, but with a delightful salty finish. 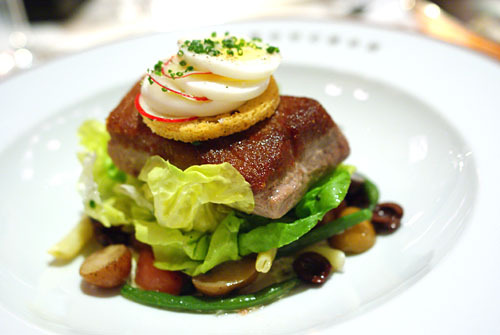 However, I loved it with the various accoutrements, which recalled a Niçoise salad. The earthiness of the potatoes, the tang of the beans and lettuce, the bitterness of the radish, and the weightiness of the egg--all worked beautifully in concert with the lightly-cooked tuna. I first tasted the lamb by itself. It was suitably tender, with a surprisingly elegant savor and just a hint of that signature lamb gaminess--quite nice. Given the finespun flavor of the meat, I found its accompaniments heavy-handed, overpowering the lamb if you weren't careful. 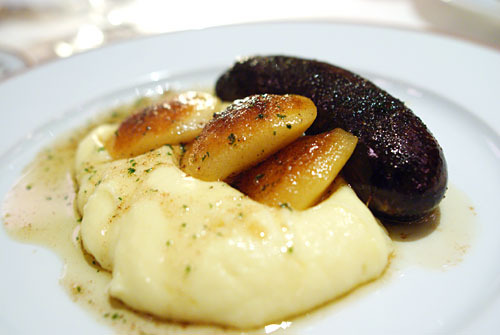 Ah, the infamous boudin noir, a blood sausage made with pork and its blood. Taken alone, it had a gritty, concentrated taste with just enough of that iron-tinged flavor. It was best when eaten simultaneously with the potato and apple, with the former tempering the power of the sausage, and the latter adding a sweet counterpoint. And here, our final savory of the night. It's hard to go too wrong with braised beef, and this was no exception. 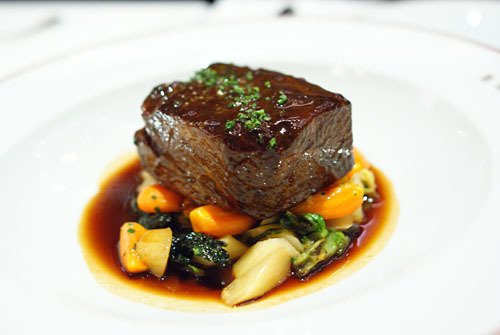 The beef was superbly balanced, both in terms of taste and texture, and I really appreciated the various vegetables used here, which added a rustic, hearty character to the dish, while balancing out the heft of the beef. Very nice. 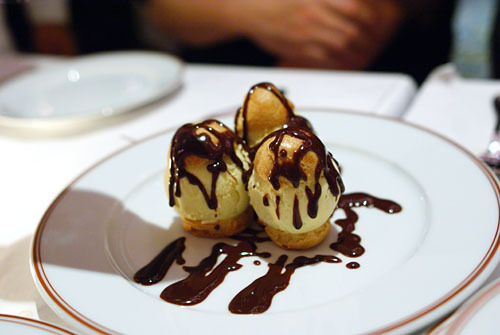 A profiterole is a puffed pastry, made with pâte à choux , formed into small round spheres, and filled with ice cream. Here, the pastry was a keen tempering element to the ice cream, with the chocolate adding a nice accent to the puffs--a classic, but delicious flavor profile. Yum. 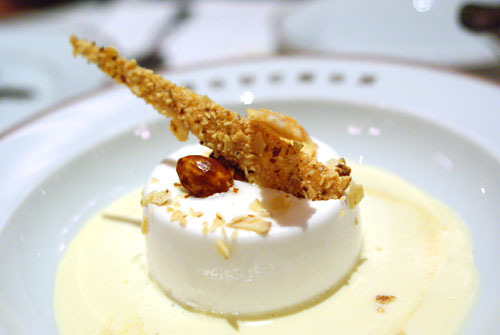 Ile Flottante, also known as floating island or œufs à la neige, is a somewhat fascinating dessert comprised of an "island" of meringue, set in a "sea" of vanilla crème anglaise, and topped here with almond and caramel. Here, the meringue was almost panna cotta-like in consistency, with an equally delicate flavor indubitably enhanced by its various sugary accoutrements. 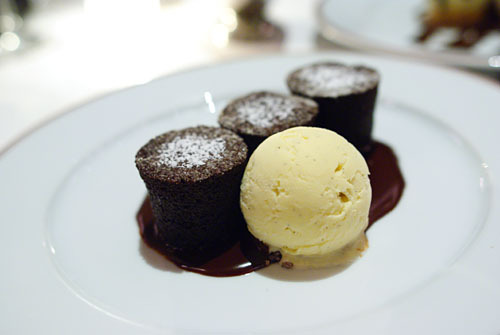 How could we not end with Bouchon's eponymous dessert pastry? Think of these as miniature cork-shaped chocolate cakes, dusted with powdered sugar. Paired with the ice cream, they were a simple, but delicious way to end the meal. Apparently, Bouchon was the place to be tonight. Upon entering, I was quickly approached by two women from Columbia Tristar, who just happened to be kevinEats readers. Then, after I sat down, Esther of e*star LA came by and said hello. I then found out that a person at the table next to me, Melissa, was a reader. After she left, guess who replaced her? None other than Christine of Folie à Choisauce and Nathan of Binary Tastebuds. Then, Stephanie and Bobby from Gourmands Review walked by. I'd conversed with Stephanie over email prior, but this was a chance first meeting. Afterwards, I ran into Hilary, who'd commented on this blog before. Also, two tables down was Betty Hallock from the LA Times; she was sitting next to Joe Pesci, by the way. Oh, and on the way out, I finally met the elusive Rameniac (Rickmond Wong). We walked out of Bouchon full and sated. In terms of food, though most of it was on point, there were certainly misses here and there. This isn't unexpected, given that it was opening night. I'm willing to give Bouchon a pass, with the explicit expectation that the wrinkles will be ironed out given time. Service, handled mostly by our lovely server Songhi, couldn't really be faulted. A particularly shining example of the level of service came when my fork fell through the crack between tables; I'd barely processed what'd happened before a waiter appeared with a new utensil--how did he know? In the end, Bouchon is a welcomed addition to the Canon Drive dining scene, and I'm sure it'll become a go-to place to satisfy your beignets de brandade cravings, once the kinks get worked out, of course. Hopefully, Los Angeles hasn't seen the last of Thomas Keller. I don't think we're quite ready for another French Laundry, but wouldn't Culver City be a great place for another Ad Hoc, or even the long-awaited "burgers and bottles" concept? I think so. So much research into chef histories. I'm always curious how you get all that information. I like the addition of panoramic photos to get the restaurant layout. Is that a new lens? the only problem with lastnight was that I was told there would not be cameras allowed.. So I listened and found out later the person on the phone was wrong, I was apologized to over and over. I will just remember through others pictures online, plus it gives me reason to go again. Reading your reviews made me feel that I was there. 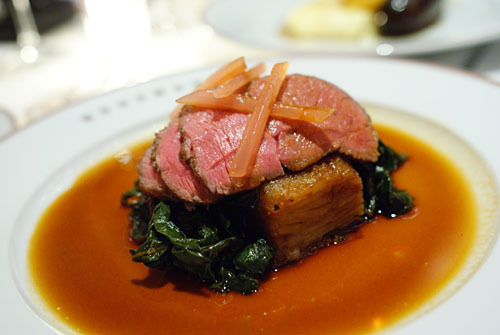 Despite the relatively few minor kinks at Bouchon, I'd love to try it in the coming months! The quiche you had wasn't a Quiche Lorraine (which is made with bacon and onion) but a Quiche Florentine (with spinach). Thanks for covering the opening! I'm headed off that way for dinner on Saturday night...and plan on trying many of the dishes you had last night. Lovely review as always! Kevin, great writeup. I am curious how you approached or asked Chef Keller about the trout? I always feel a bit uncomfortable, even in non-fine dining restaurants, to ever bring up issues with a chef. I know, I know. I am the customer and I should but I get very nervous and feel "bad" about it. Your review and photos are amazing as always. 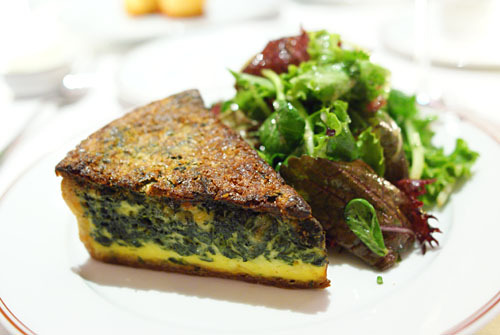 The quiche is my favorite item on the Bouchon menu. My second favorite item is THE FRIES. So perfectly crisp on the outside and soft inside, salty and slender, they are the platonic ideal of a potato. Major props to the sommelier and bar staff for excellent service too. Dave ordered the Proper Irish, which was invented by the bartender Anthony (who incidentally along with a few other staffers transferred from the Vegas location to ensure a smooth opening night), and was served with a fiery spark of orange zest. Love the panoramic images!!! GREAT job. Chef that I am, I am NOT a fan of most cliche food 'Blogs'. That being said your Writing, Photographs and Insight is great! Wonderful review! I am planning to go on my birthday (next Tuesday) and hope to write a review as well. Outstanding analysis of each course. I appreciate your thorough and clear thoughts on each item! 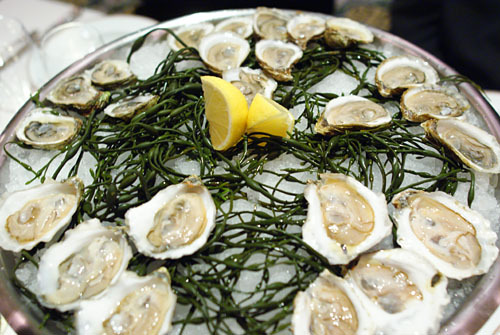 I believe the oyster is Fancy Sweet not Fanny Swede and the Beau Soleil Oysters also came from New Brunswick. Wonderful review. Exquisite in detail and a joy to read. Thanks. wow Kevin! great write up as always. i'm going next tues and can't wait. Funny, I was just telling someone Culver City would be PERFECT for Ad Hoc. And if Keller ever does open his "burgers & bottles" dream there's no place in the world better than LA! LA's totally a burger town. Danny: When are you planning to check it out? Anon 1: That's what I thought, but our server explicitly said Lorraine. Thanks for confirming my suspicions; I've updated the post with the new information. Dylan: It's great to hear that you had a pleasant experience. Who did you end up going with? Anon 2: You're welcome! 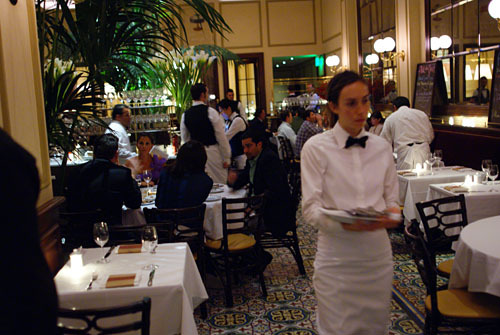 How did Bouchon turn out for you? Hilary: It was great meeting you too! You know, I can't believe that I failed to order the fries! We were going to order the steak frites and the mussels, both of which have them, but ultimately decided on other entrees. Agree about the bar--the cocktails were surprisingly inventive, as well as tasty. Germaine: Thank you chef! Just curious, what do you dislike about most other food blogs? Anon 3 I actually haven't been to Anisette or Comme Ca. But currently, I'd say that C&S would probably give you a more solid experience. However, once Bouchon gets past its growing pains, it'll likely be more polished. Rose: Thanks Rose. Let us know how it turns out, and happy birthday! Ryan: Ah yep I think you're right; I've made the correction. I could've sworn our server said "Swede" though. Holly: Please let us know how you like it! Who are you going with? Umm I guess to your left.. you had 4 people right, 2 girls and another guy? I think I cannot remember which seat you were in haha. The camera thing was upsetting but I was apologized to.. Next time, and there will be a next time. This was a very fun night! What an amazing sight and structure that is Bouchon! Plus, the roast chicken is amazing, and so was the beignets de brandade! Just couldn't snag some time with the man himself that night, but I did see the kitchen. I really appreciate all of your posts, especially when I can see a good photograph of what I ate! Krystle: I had four people at my table, but they were all guy friends of mine. The table to my right had two girls and two guys, so perhaps you were thinking of them? 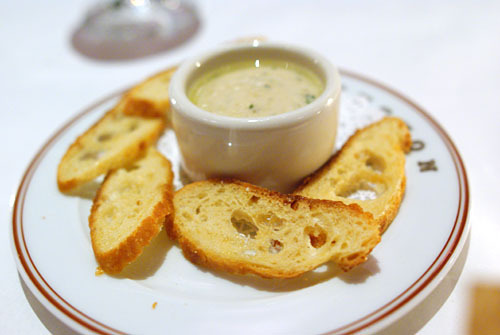 Josh: I really enjoyed the brandade, and I recall the poulet being quite good up in Yountville. You were there opening night right? Did you see me? You should've come by and said hello! I did see you, and I will definitely say hello the next time there is an exciting restaurant opening, maybe Hatfield's! By the way, I heard Hatfield was opening on New Year's. What happened to Fall? As for Hatfield's, 1/1 is the last I heard as well. I think they're having a hard time converting the old Red Pearl Kitchen space, and I'm doubtful even that they'll make New Year's. Purple shirt girl here from the ad hoc book signing at WS in SCP! I just wanted to update you... 1st - we did get reservations at The French Laundry for our honeymoon in February! YAY! 2nd - we had dinner at Bouchon Beverly Hills last Saturday night...it was fantastic - I think the initial kinks may have the been smoothed out. 3rd - we loved the atmosphere at Bouchon Beverly Hills so much that we returned yesterday to take our engagement photos in the restauratnt! I worked with Ryan the special events manager and Jerry the Assitant GM - they allowed us access prior to the day's service. We even met Executive Pastry Chef Jeffrey De Leon. They were so accommodating. Our photographer was so giddy with excitement - he said the light in the restaurant was beautiful! I can't wait to see how they turned out! Now, you must think it's a bit strange to take engagement photos at Bouchon but it does have history for us - Bouchon Las Vegas is the scene of many of our celebrations together and of course my obsession with TK and his food. There is no question that our honeymoon would revolve around TK restaurants! So why not extend it to our engagement photos as well! 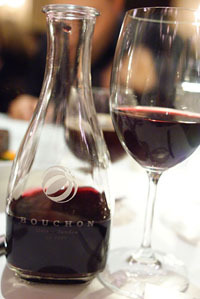 Good to hear that Bouchon has indeed stepped up its game! The decor is quite nice in there; I could see how you'd want to get your engagement photos done inside. I'd be interested to see how they came out. ;) How did you manage to get the TFL reservations? As far as the TFL reservations, we "divided and conquered". We had made arrangements with a couple of concierge contacts up in the Napa Valley to attempt securing a reservation for us - our hotel concierge at Bardessono, the concierege contact at Darioush Winery, as well as my contact at Bouchon Las Vegas (who put us on the priority wait list). While none of them could guarantee a reservation, we figured the more people trying, the better the outcome. In fact, our concierege contact at Darioush Winery was the one who utimately got through and secured a table for us. The photos look great Ellen! Congratulations, and enjoy your meal at The French Laundry!
. My wife and I went on valentine day for an early afternoon dinner with our best friends. The wait person Sarah made our experience a memorable one! 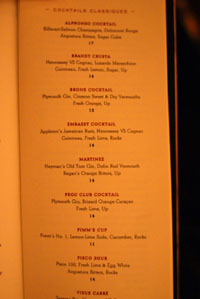 For starters, drinks abundant and perfectly mixed. The appetizers, pate de campagne with toast points, quiche Florentine light and fluffy with a dressed European salad mix, tuna tartar diced with , magnificent. The Flavors were all bursting off the plates. dinner plates, short ribs-large and juicy. trout almandine with haricots Verde perfectly fantastic, mussels in broth abundant well over 2 dozen+ in a saffron white wine broth. I chose a frisee salad for my entree with sautéed forest mushroom and braised Brussels sprout sides, plenty of portions, plenty of flavor. top off the meal with profiteroles floating with a delicate chocolate sauce- to die for! the best valentine day experience we have ever had. We cannot wait to return very soon. Good to hear that you had a great time here. I've heard that Bouchon has really stepped up its game since opening. Let us know how the meal turns out! Great to hear that you had a good meal Daniel--sounds like Bouchon has definitely improved. Interesting comparison to soondae BTW.